Rural villagers have bush gardens in the Solomon Islands where TerraCircle Inc does most of its work. In Australia, urban residents have community gardens. Both have a lot to do with community food security – the year-round supply of sufficient food to support an active lifestyle. TerraCircle recently concluded a project to assist Randwick City Council develop a policy on community food gardening. The policy sets out the process for citizens as a group to approach council for assistance in starting the gardens, most of which are built on public land classified as public open space. The initiative aligns Randwick with other local governments in the Sydney metropolitan area that have adopted or are in the process of adopting similar policy, including the City of Sydney, Leichhardt Council, Blue Mountains City Council, Woolahra Council and Wollongong Council. Community gardens can supply a limited volume of the food needed for healthy living. 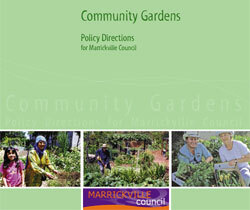 Research conducted by Russ Grayson while producing a policy directions document for Marrickville Council, an earlier TerraCircle project, disclosed that, as well as fresh food grown by methods that the grower trusts, community gardening produces a social return on investment for councils. This includes creating safe places for social interaction and making friends, informal learning venues, opportunities for active recreation and developing skills in deliberative democracy such as shared planning and construction and decision making. They also make for safer streets and bring an element of regreening to our cities, frequently making productive use of underutilised urban land. In mid-2011, the discovery in an inner urban community garden of a long-nosed bandicoot, an Australian native animal rare in the cities, indicated their value as urban wildlife habitat. TerraCircle’s move into food security work in Australia complements its similar work in the Solomon Islands. A continuous supply of nutritious food is a basic necessity wherever people live, and TerraCircle looks forward to increased involvement in educating and assisting people secure their access to it wherever they live. The TerraCircle consultancy with Randwick Council was done by TerraCircle member, Russ Grayson (pacific-edge.info) who also wprks with the Australian City Farms & Community Gardens Network (communitygarden.org.au) and is currently Community Gardens and Landcare Coordinator with the City of Sydney.